Previous Previous post: Six things, people, and then I’m off to wash my clothes in a bucket. You make a great case for going back to the days when only white, male, landowners were allowed to vote. (Just kidding, fellow j-bo readers). 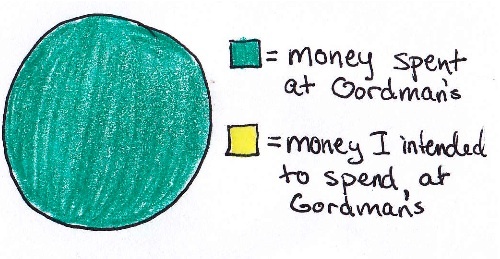 I wish I could use pie graphs and create such a hilarious post! Brilliant! I have to relate to the chocolate one. And the spending one. Ooops. Funny stuff. I’m still waiting for your pie chart on pies, though. Noted. Could be a festive Thanksgiving post, maybe. Love these! The chocolate one is particularly easy to relate to. Also, the muffins. Anything that involves overindulging on carbs, really, is going to speak to my heart no matter what. Maybe I should make a venn diagram of the overlap between chocolate and muffins. Better yet, I should probably just go make some chocolate muffins. There was an old lady who lived in a shoe,She had so many children, she queiiflad for public assistance and food stamps.Jack be nimble, Jack be quick.Jack jumped over a candlestick.Goodness, gracious, Great Balls of Fire.Mary, Mary, quite contrary,How does your garden grow?With silver bells and cockle shells,And one stupid goddamn eggplant.Hickory dickory doc,Three mice ran up the clock.The clock struck One,The other two escaped with minor injuries.